Goodbye, 2010. Hello, 2011. Click here for the stories from this year so far, courtesy of the Associated Press. 2010's days, hours, minutes, and even seconds are numbered, while 2011 sits just around the corner. Click here to read more on where the battle to re-draw Georgia's congressional and state legislative districts will be fought. Georgia moves up to ninth on the total population list. That was the result of U.S. Census figures released Tuesday. The Associated Press reports that Georgia added more than 1.5 million residents over the last decade. That brings the population for 2010 to 9.7 million. Just a decade ago, the Peach State had more than eight million residents. What has been a rumor for most of the last decade is now a reality. 2010 Census figures released today (Tuesday) show that Georgia will get one new district in the U.S. House of Representatives. That brings the total number of congressional districts in the Peach State to 14. That's up from 13 in the 2000 Census. Community banks still feeling the pinch of the "Great Recession"
Two years after the start of the financial crisis, many community banks still find themselves struggling to stay afloat in the current economic downturn. Macon.com has details on how the smaller institutions are dealing with the ongoing meltdown. 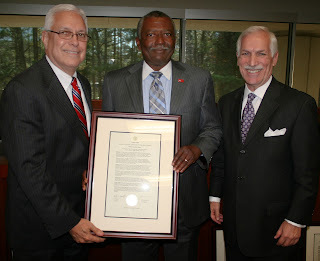 Albany Technical College President Dr. Anthony Parker (center) receives a proclamation from Technical College System of Georgia Commissioner Ron Jackson (left), and TCSG State Board Chairman Dean Alford (right)﻿, for being named a top four finalist for the Governor's Technical College of the Year on December 8, 2010. But it was Wiregrass Georgia Technical College that won top honors almost a week earlier, on December 2, 2010. Click here for the complete story, courtesy of the Valdosta Daily Times. The complete press release of WGTC accepting the award can be read here. Click here for the press release from ATC. Could the GMHOF be heading down south? That's definitely possible, as both the Georgia Sports, and Music, Hall of Fames, might soon be on their way out of Macon sometime next year. The Albany Herald reports that the leaders of two Albany area institutions are making their pitch to bring the Georgia Music Hall of Fame to southwest Georgia. Click here for more details. That's what Teresa Tomlinson did Tuesday night, as she defeated Zeph Baker in a runoff, to become the first female mayor of the Fountain City. Click here to find out more about this historic election. The Georgia Public Broadcasting television network could grow by one station sometime next year, or beyond. OnlineAthens.com reports that the University of Georgia is currently in negotations to make WNEG-TV part of the GPB group. They've been ongoing since September. Here are select stories from the biggest shopping day of the year, "aka" 'Black Friday', from a Georgia perspective. How are the "mom-and-pop" stores doing? It depends on whom you talk to. Click here for more details. Shoppers in southwest Georgia are searching for the best deals on the perfect Christmas gift too. Mysouthwestga.com has the details here. Finally, Macon.com has tips on how to protect those precious purchases. It's official! Football will return to Mercer University in Macon after an absence of nearly seven decades. University officials made the announcement on Friday. Click here to view the 20-minute news conference. and a president of another two-year institutition says he's going for four years. Click here for the details. How did the Republican Party come to be the dominant force in Georgia politics? Click here for the weigh-in on last Tuesday's historic mid-term elections. The 2010 mid-term elections have moved into the history books. What's next? Here's a quick recap of Tuesday's aftermath. As the 2010 general election draws near, there's no still clear cut candidate for Georgia governor. Click here to find out the latest results on what likely will be one of the tighest gubernatorial races in state history. Find out who he is by clicking here. GNB is online at georgianewsbeat.blogspot.com, on Twitter at twitter.com/georgianewsbeat, on Facebook, and avaiable via e-mail at georgianewsbeat@gmail.com. Just eight days remain until the general election happens on November 2. A new poll conducted by Atlanta television station WXIA, and radio station WVEE shows that a runoff for Georgia governor could be imminent. Click here to find out what the results of that poll reveal. GNB EXTRA--Move the "Halls of Fame"
That's what a Fulton County commissioner says should happen to both the Georgia Music and Sports museums, both of which currently call Macon home. But both facilities have struggled financially in recent years, and are now mostly dependent upon taxpayer support to stay open. Click here to read more on this story, courtesy of the Associated Press. The alleged tampering on standardized tests in the Atlanta and Dougherty County school systems leads to a statewide investigation. Click here and here for more details on both probes. The Princeton Review has two separate schools from one Georgia institution among the nation's best graduate programs. Click here to read which university has those top-notch schools. How did all 159 Georgia counties fare in terms of participating in the 2010 Census? Click here for the map, and type in zip code, or city and state. Remember to click "Check out your community's results" once there. A prominent Columbus attorney is facing drug charges. Ledger-Enquirer.com reports that Mark Shellnut was arrested outside of the government center in Columbus just before noon Thursday. Authorities say the arrests were related to charges involving prescription drugs. Additionally, WTVM reports that Shellnutt faces up to eight counts on those charges. It's back to "square one" for Albany officials. A new search is now underway after Shannon McCullough withdrew his name from the director's position at the Albany Civic Center Monday. Click the link below for more details. Welcome to "Election Countdown 2010" here at GNB...There are 55 days remaining until the 2010 general election across Georgia on November 2. Here's a brief look at the number "55" 'by the numbers"
55%--The percentage of the vote that Rahn Mayo earned to win the Georgia House District 91 seat in a runoff in 2008. Michael Harden from House District 28, and Rich Golick from House Distirct 34, both Republicans, won November general elections for their respective seats by that same percentage later in 2008. In Georgia House District 55, incumbent Rashad Taylor defeated Mabel Thomas in the July 20 primaries. With no opposition in November, Taylor will retain that seat. In Senate District 55, Gloria Butler has held that post since 1999. The Chief Operating Officer (COO) of DeKalb County is out of work. Find out what led his dismissal by clicking here. GNB EXTRA--Georgia wins "Race To The Top"
Good news for Georgia schools. The Associated Press reports that 26 school districts statewide will share around $400 million in federal funding over the next four years. The goal is to help improve the state's crumbling education fortunes. Click here for more details. and former Governor turned 2010 gubernatorial candidate Roy Barnes shares his thoughts on the state of education in Georgia. Click here to view the video. It's Ken Hodges vs. Sam Olens for Attorney General, while Georganna Sinkfield will do battle against incumbent Brian Kemp for the Secretary of State's office come November. Click here to find out what happened Tuesday night. Former Georgia Secretary of State Karen Handel has conceded to former U.S. Congressmen Nathan Deal in Tuesday's runoff for the GOP nomination for governor. Read the details here. Note: As statewide runoff elections loom closer, here's one final installment on how Tuesday's race for the GOP gubernatorial nomination will turn out. Metro Atlanta continues to be on the grow. That's according to Business First of Buffalo, New York. The publication reported that Atlanta's population now stands at more than 5.6 million residents. That makes it the seventh largest metropolitan area in the nation. Click here for more details on this story. Also, find out how other Georgia metro areas fared here. Nearly every school in Walton County has met the AYP goal. Click here for the details. Note: Here's the first in a series of select articles leading up to the August 10 runoff elections, including the race for the Republican gubernatorial nomination. Click here to find out which Georgia county made the list of the 25 best counties in America for jobs, according to CNNMoney.com. She may no longer be Governor of Alaska, but a former vice presidential candidate has become a strong influence on the race for Georgia governor. Read how the "Sarah Palin Effect" will affect the outcome on who will win the GOP nomination here. Note: Here's a quick recap, and read, of the top stories regarding Tuesday's primary elections in Georgia. Former Governor Roy Barnes easily wins the Democratic nomination, while a runoff is looming on the Republican side. Click here and here for details on both races. Ex-Dougherty County District Attorney Ken Hodges easily won the Democratic nomination over Rob Teilhet in Tuesday's primarily election. Click here for the reaction from Albany. Plus, read local reaction from Cobb County as one of their own is headed for a runoff in the Republican race. Also, read more reaction on the Democratic side here. It's official. Mike Keown will face incumbent Democratic Congressman Sanford Bishop in Georgia's 2nd Congressional District on November 2. Keown won the Republican nod for that seat in a landslide Tuesday night. Click here to find out how he did it. In the 8th Congressional District, Austin Scott won the right to face another incumbent Democrat, Jim Marshall, in November's general election. Click here for the details from Tifton. Click here for a complete list of results from races statewide. Also, visit other portions of the site for a complete election recap at georgianewsbeat.blogspot.com. Note: This is the final post in a series leading up to Tuesday's primary election in Georgia. Below is a select list of articles on the primary races statewide. Note: Our countdown to Tuesday's primaries continues with a brief outlook on the race for Insurance Commissioner. Quick Analysis: The 2010 race for Insurance Commissioner is one heavily dominated by the Republicans, as nine candidates are vying for the GOP nomination, compared to just one Democrat, plus one Libertarian candidate. Don't be surprised to see a runoff between at least two candidates before the end of the summer. Click one of the links below to find out more about the candidates for Insurance Commissioner. Finally, here are a few select articles from around Georgia concerning the race for Insurance commissioner. GNB is online at georgianewsbeat.blogspot.com, as well as on Twitter.com at twitter.com/georgianewsbeat, on Facebook by clicking the "Like" button, and available via e-mail at georgianewsbeat@gmail.com. Note: Our countdown to Tuesday's primary election moves on with a brief outlook and analysis on the heated race for Georgia Attorney General. Analysis: The race for the Democratic nomination appears to be the more heated of the two sides, as both candidates have traded parting shots at each other during their volatile campaign. The most recent controversy was generated from the Teilhet, which aired a 30-second TV ad featuring Emily Walker, the mother of Kenneth Walker. Walker was killed by former Muscogee County sheriff's deputy David Glisson during a traffic stop in late 2003. Hodges chose not to seek an indictment against Glisson after Hodges failed to swear him in, prompting the controversy. Analysis: Unlike the race for the Democratic nomination, the GOP side appears to have had no drama so far. Still, the most recent polls show Wood holding the edge to represent the Republican Party in the November general election. Note: Our next installment on "Election Countdown 2010" focuses on the race for Georgia Secretary of State. Five candidates are running in the Democratic primary, while there just two candidates running for the Republican nomination. Gail Buckner--A Clayton County native, Buckner has represented state Senate District 44 since 2008. Gary Horlacher--Originally from Florida, Horlacher has managed campaigns ranging from Labor Commissioner to Lieutenant Governor. Michael Mills--Mills political career in Georgia started as an aide to former Secretary of State Lewis Massey. Angela Moore--A native of Washington, D.C. Moore is no stranger to Georgia politics, as she ran for a seat on the DeKalb County Commission in 2004. Georganna Sinkfield--Sinkfield is one of the longest serving lawmakers in the Georgia General Assembly, having first been elected to office in 1982. Brian Kemp--Seeking his first full term in office, Kemp assumed the Secretary of State duties from gubernatorial candidate hopeful Karen Handel. Doug MacGinnitie--A Dunwoody native, MacGinnitie served on the Sandy Springs City Council. Note: Our countdown to the July 20 primary elections continues with a brief outlook on the Lieutenant Governor's race. Casey Cagle--As the first Republican to serve as Lieutenant Governor, Cagle hopes to win re-election to that seat in November. Carol Porter--Should they be successful in the November general election, DuBose and Carol Porter could become the first husband-wife governor/lieutenant governor tandem in Georgia history. Rhonda Martini--A Libertarian, Martini is a dentist. Note: Starting tonight (Tuesday), there will be brief summaries of select primary elections throughout Georgia, starting with the race for Governor. They will continue until Monday, July 19, the day before the primary elections in Georgia. Thurbert Baker--Three-term attorney general has held the seat of the state's top prosecutor for the last 13 years. Roy Barnes--Former governor and Marietta native hopes to recapture the top seat after losing to Sonny Perdue in 2002. Bill Bolton--Another native of Cobb County, Bolton has three engineering degrees from Georgia Tech. Carl Camon--Serving five terms as the mayor of tiny Ray City in south Georgia, Camon faces long odds in winning the Democratic nomination. DuBose Porter--The current House minority leader, as well as a native of Dublin, Porter once served as an intern with former U.S. Senator Sam Nunn. David Poythress--A former general in the U.S. Air Force, Poythress is no stranger to Georgia politics, as he gave up the Labor Commissioner's job to run for governor in 1998. Randal Mangham--A representative in Georgia House District 94, Mangham is also a long shot to represent the Democrats in November. Jeff Chapman--A Brunswick native, Chapman hopes to use a "family friendly" approach to his campaign. Nathan Deal--A former U.S. Representative representing Georgia's ninth congressional district, Deal is one of the favorites to represent the GOP in the general election. Karen Handel--The former Secretary of State hopes to make history as Georgia's first female governor. But she must navigate her way through a very strong Republican field. Eric Johnson--First elected to the state Senate in 1994, Johnson went on to become the President Pro Tem. Ray McBerry--In a campaign marked by controversy, McBerry faces a tough task in winning over voters. John Oxendine--As the longest serving Republican constitutional officer in Georgia, Oxendine is another favorite to claim the GOP gubernatorial nomination. John Monds--With the recent decision by Ray Boyd to withdraw, the Libertarian from Cairo is the only third party or independent candidate to run for governor. Want to know more about the candidates? Click here. and the Dodge County News has more on whether the millage rate for the school board will stay as is...or change to a new number. GNB EXTRA--UGA looks for a new A.D.
Damon Evans is no longer the athletic director of the University of Georgia. Evans resigned Monday after his arrest on DUI charges last week. Here's a sampling of articles surrounding the scandal, and the search for Evans' replacement.